Flavor Text: "So, this is what they mean by 'Pulp Horror'?" BOOM!!! Here is one of the best agency attachments. It impacts the game just by being in play, making your opponent unlikely to overcommit. 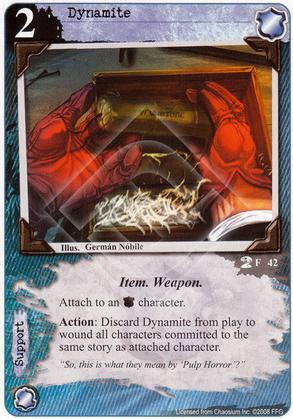 Used once it can be devastating but when combined with recursion this can win games. Agency can also force your opponent to commit all his characters to one story for a one-sided reset. I agree with Mulletcheese 100%. My favorite combination is giving this to someone who is tough to target (like Officer Gibson, or Relentless Stalker if I have the Hunters of Ardenne in play). That way, I can just sit and wait to use the Dynamite at the right time without much fear that I'll lose it until I'm ready. For maximum lethality, pair with Flush Them Out (as Mulletcheese hinted at), Death Comes For All, or both! Oh, and giving the Dynamite to Abbess Allegria is fun too if you have a conspiracy on the table. Not just for the fact that the Abbess is immune to the Dynamite herself, but also just for the flavor of having a conspiratorial nun running into the fray with a lit stick of dynamite! Eat your heart out, Sister Sofia with your little sawed-off shotgun!